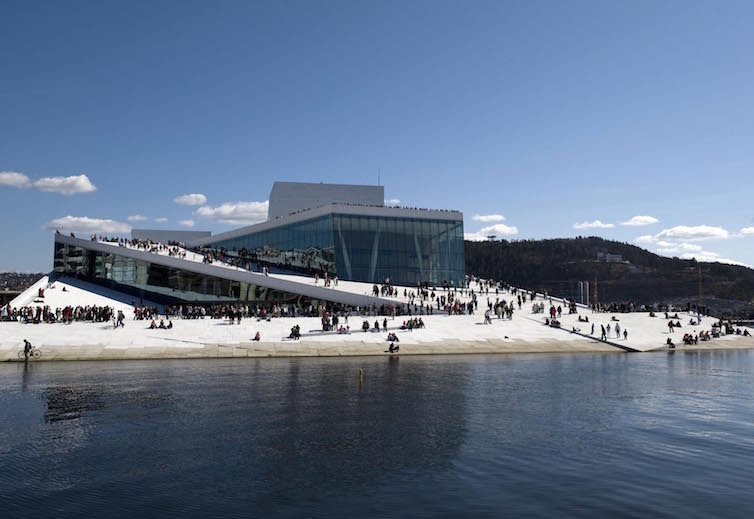 Located right at the harbor, the angled white exterior of Oslo’s Opera House appears to rise from the water, inviting visitors to not only to climb its roof and enjoy panoramic views of the city and the fjord, but to also take in a world-class opera, ballet or concert program. Since the 1970s several visually striking opera houses have been built on large sites with open spaces in waterfront locations following the Sydney Opera House, which became a symbol of the city and the nation. Oslo Opera House has followed this trend, but distinguishes itself in that its “open space” is located on the roof of the building. Since the opening of the the Norwegian National Opera & Ballet in 2008, pictures of the angular architecture seeming to rise from the waters of Oslo Fjord have become known around the world and today are considered the keystone signature of the Oslo Opera House. This was precisely the intention of Snøhetta, the architectural firm behind this iconic design, which set out to make the roof a platform accessible to all, thus creating a new public space in the center of Oslo, and cultivating a new landscape that would draw together the natural beauty of Oslo Fjord and the city. In the foyer visitors are met by a light-filled, open space with a large, undulating wall of oak wood. Behind this wall are the opera house’s three performance halls, with the Main House forming the heart of the building. Acoustic requirements helped to shape the interior design of the Main House, and the combination of timbre and tonal possibilities with the dark, golden woodwork can be said to have transformed the Main House into a singularly outsized wooden instrument. Founded in 1957, the Norwegian National Opera & Ballet is Norway’s largest music and performing arts institution. Since the opening the new opera house, it is enjoying record audiences. The current season features some of the most popular opera titles of the repertoire including Rossini’s La Cenerentola in February, Bizet’s Carmen in March, and in May Puccini’s beloved La Bohème. The opera house also highlights less familiar titles, such as the French impressionist opera Peleas et Melisande by Debussy. The ballet program promotes a similar balance of tradition and innovation with several contemporary dance performances inspired by classical titles like Ibsen’s Ghosts, Carmen – a ballet by Liam Scarlet or Sleepless Beauty.